Loss by DeMatha (Hyattsville, Md.) shakes up top of the rankings. Wide receiver J.D. Benbow of Smithville (Mo.) makes an incredible pass under pressure. Upsets toppled several top teams, paving the way for new additions to the Xcellent 25 National Football Rankings presented by the Army National Guard. DeMatha, Spartanburg and Mater Dei all lost, shaking up the rankings — particularly the Top 10. DeMatha's loss to undefeated Gonzaga paved the way for Georgia power Colquitt County to enter the Top 5. Rush Propst's squad has been dominant on both sides of the football. The loss by DeMatha also impacted both American Heritage (Fla.) and IMG Academy (Fla.). St. John Bosco jumps Centennial to become the top team in California and the No. 2 team overall. The Braves blasted league rival Mater Dei 42-21. There's a great chance that St. John Bosco and Centennial collide in the playoffs, and both teams are pushing No. 1 Bishop Gorman for the top spot, as are No. 4 Allen and No. 5 Colquitt County. 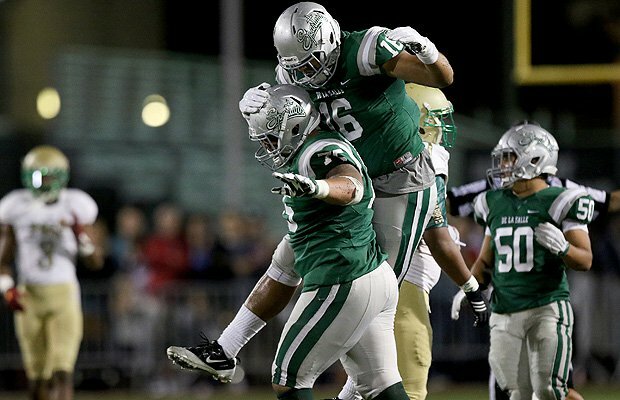 De La Salle had plenty of reason to celebrate in a big win over Long Beach Poly. The Gaels moved to 8-0 with a 63-7 win over Legacy. Centennial cruised to a 59-7 win against Roosevelt. The Packers are dominating opponents. This week, Valdosta fell victim, 49-14. Chris Scott's squad pounded Tallwood, 77-0. Katy beat Morton Ranch, 55-0. The Tigers blanked Tupelo, 35-0. Trinity held on against Southlake Carroll, winning 37-35. Alabama's top team pounded Woodland, 72-6. American Heritage narrowly defeated Cardinal Gibbons, 21-14. Grayson shut down Central Gwinnett, winning 35-2. Its defense is playing at an extremely high level. The Longhorns defeated Grand Prairie, 35-7. Male avoided an upset bid by St. Xavier, coming away with a 27-24 win. The Eagles beat Canada Prep, 42-10. The Cardinals defense pitched a shutout against Lakota East, 34-0. Aquinas got back to its winning ways with a 41-13 blowout of Fort Lauderdale. Gilman dominated Archbishop Spalding, 48-7. Hamilton took care of Basha, 61-14. After pounding Godby, Trinity Christian followed up with a 51-6 win over Duval Charter.